how to convert mov to mp4 with Cute Video Converter. Guide:How to convert mov to mp4 ? 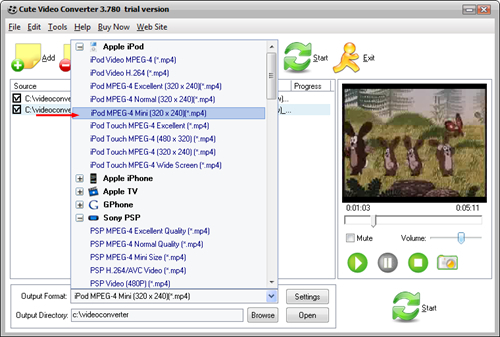 Cute MP4 Video Converter:Convert any video to mp4 video. Cute AVI Converter:Convert any video to mp4 video. Cute Video Converter can help you convert mov files to mp4 video with ease! And the mov to mp4 converter will bring you the fast conversion from mov video to mp4 file with excellent quality. The bellowed tips will tell you how to step by step convert mov to mp4 with the powerful mov to mp4 converter software. 2.Add "mov" video files by clicking "Add" button in the main interface. 3.In "Output Format" drop down list box, you may select output format:'mp4 Format'.Select output folder. 4.Click "Start" button! After a few minutes waiting, you can play the converted mp4 files on your mobile. Tips 2: If you need, append many tasks at one time and the mov to mp4 converter will convert them one by one for saving your time. Tips 3: Cute Video Converter provides various mp4 video settings and these formats are classified by device to let you use conveniently.